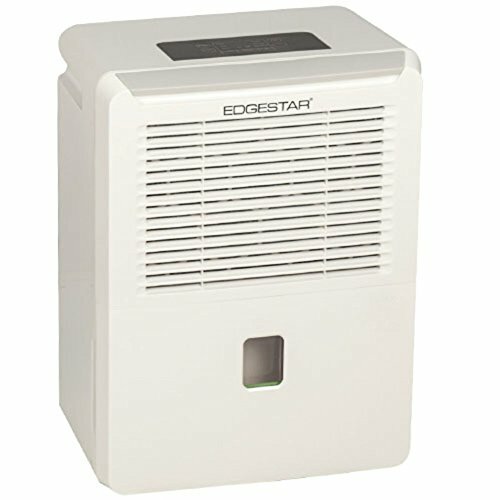 Maintain the proper humidity level in your home with the EdgeStar 30 Pint Portable Dehumidifier (DEP301EW). This portable dehumidifier removes up to 30 pints of moisture from the air over a 24 hour period and covers an area of up to 1,500 square feet. Weighing in at only 29 pounds, the EdgeStar 30 pint portable dehumidifier is compact but loaded with features that make this model versatile and suitable for your home. Dimensions: 19 7/8" H x 14 3/16" W x 9 13/16 " D. Up to 30 pints of moisture can be removed from the air over a period of 24 hours. This EdgeStar model can provide coverage for an area of up to 1,500 square feet. This newly redesigned model features a top loading air filter which eliminates the need to remove the water bucket before changing or cleaning the filter. Desired humidity levels can be set from 35% to 80% in increments of 5% and the digital read out shows the current humidity levels. The DEP301EW automatically turns off when desired humidity levels have been reached or the water bucket is full. Heavy duty caster wheels and sturdy easy-grip handle allow for this dehumidifier to be easily moved from room to room. While temperatures under 65 degrees F adversely affect the performance of other dehumidifiers, the DEP301EW is fully functional even at 41 degrees F. Through quality construction and more durable internal components, the EdgeStar DEP301EW is designed to last longer and work in more rigorous environments than other brands. Both the compressor and fan shut off once the desired humidity level is reached which keeps noise to a minimum. In the event of a power failure, this unit will automatically restart once power is restored. Removes 30 pints of moisture; Recommended for room sizes of 400 sq. ft.; Removes moisture in an area up to 1,500 sq. ft.
Quiet operation; Direct drain option; Perfect for basement and crawl space environments.